Let us tell you the story of the beginnings of our church and how we became what we are today. On August 18, 1854, at the home of Dr. J.C. Plante an organizational meeting was held to lay the foundation for the formation of a new Presbyterian church in Scranton. The church was the inspiration of Rev. Burr Baldwin of Dunmore and had eight charter members. 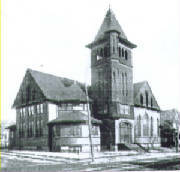 The new church was incorporated as “The First Presbyterian Church and Congregation of Hyde Park”. A small frame chapel was built in the 300 block of North Bromley Avenue and was dedicated in January 1857. 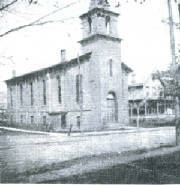 In addition to weekly worship services, Sunday School classes began in 1857. The new church grew so rapidly that by 1862 an expansion program was begun. A lot in a much better location was purchased and a large brick church was built on the corner of Washburn Street and Hyde Park Avenue. It was dedicated on August 13, 1863, in the midst of the Civil War and served the congregation for the next 30 years. However, in 1893, because of reckless mining in the vicinity, the building was severely damaged by mine caves and had to be demolished. The following year, groundbreaking took place to erect a large frame Victorian style church on the same site. The building took three years to complete and was dedicated on January 7, 1898. The church stood for less than 20 years when it was completely destroyed by fire on Sunday morning, January 18, 1914. Undaunted by the disaster, the congregation chose once more to rebuild. 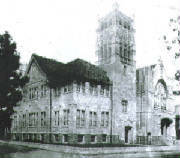 This time the building was a large Gothic style frame stucco structure which was dedicated on Sunday, July 4, 1915. The building served the congregation for 67 years until it too was completely destroyed by fire on Wednesday, March 24, 1982. Led by Rev. LeRoy Beckes, Pastor, the congregation once again met the challenge and plans were begun to erect a new facility. Groundbreaking for the current building was held later that year. During the time that the building was being constructed, worship services, the first of which being on Resurrection Sunday, April 11, 1983, and other church activities were held in the First Baptist Church on Main Avenue. The new house of worship, a red brick structure designed in modern style, was dedicated in 1983. Although the Gothic style church was completely ravaged by the fire, the unrelenting flames were unable to damage some of the church’s furnishings and they were saved and incorporated into the new church facility. The communion table which is presently used in the church sanctuary had fallen through the fire into the basement of the structure and was found intact, completely untouched by the flames, water and smoke. Also found among the ruins were Bibles which had been used in the church and Sunday School rooms. They too were spared from the blaze and sustained no smoke or water damage. A good deal of ingenuity was used in the planning of the new church facility. Stained glass windows, which had fallen unbroken into a neighboring yard, were reset to create a picturesque mosaic and then framed and hung as doors in the serving area of the kitchen. Evidence of the old church is also visible in the baptismal font which is housed in the front of the sanctuary. 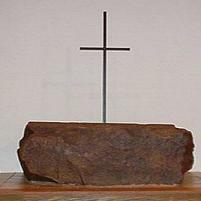 The cornerstone from the burned structure was refinished and an indenture was honed into the top to create a font unique only to Hyde Park Church. And so out of the fire, a new house of worship arose and a new era for the Hyde Park church had begun. For many years, the organization was widely known as the Washburn Street Presbyterian Church. In 1957 the name was changed to Hyde Park Presbyterian Church following a merger with the former Ebenezer Welsh Presbyterian Church and the two congregations were joined into one. Many prominent West Scranton citizens have been members of this church over the past 150 years. Twenty-five dedicated members of the clergy have served as pastors. Each of whom has touched the lives of their respective congregations in their own special way. During the 150 years since the church was founded, thousands of worship services have been conducted here, in addition to innumerable weddings, baptisms, and funerals. The church has enjoyed achievements and triumphs, as well as its share of trials and tribulations, all of which are woven into the tapestry that has become the history of Hyde Park Presbyterian Church. What does remain clear as we enter a new era is our determination and commitment to go fearlessly into the future with Christ as our sure foundation.